Appliqué has unjustly earned a reputation as “the ‘A’ word,” a fussy, time-consuming technique that many quilters avoid like a plague. 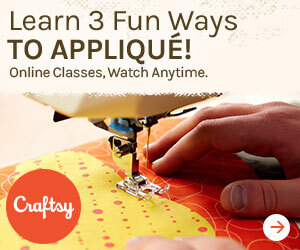 But there’s lots to love about appliqué, and it really isn’t scary! The lecture takes the intimidation out of appliqué and shows the wonderful possibilities it adds to quiltmaking. I’ll discuss finding an appliqué method to suit your own quilting personality—no hard-and-fast rules are presented, only suggestions for finding an appliqué technique that works for you personally, with tips and tricks for avoiding some of the pitfalls that give appliqué such a bad name. A perfect complement to any of my appliqué classes.